Having recently undergone extensive renovation, we look forward to welcoming you to dine in our well designed, stylish, comfortable restaurant. Offering our customers, a place where you can enjoy great food but where you can happily bring your children. We understand that wine is an important part of any meal, which is why we work closely with our wine suppliers to ensure that our wine choices compliment with Inverarity Mortons who are excellent at sourcing our more modern range. 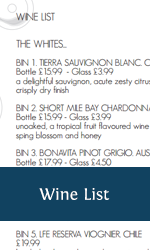 Click here for wine list. 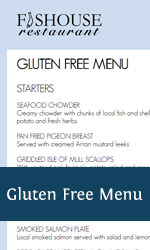 We’re pleased to be working with some incredible food suppliers including Caledonian Oyster Co., Isle of Mull Scallops, Gordon the Prawn – helping us serve locally caught Langoustines, to name a few. Children’s portions are available on request. 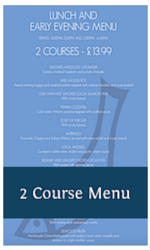 We have never strive to be a “Fine Dining” restaurant and try to use Michelin star, local ingredients in an uncomplicated fashion with attentive service and a view to remember – topped off with a fantastic wine list and our own local ales. Please note, we do try to our best to accommodate seating requests however when the restaurant is busy, it is not always possible to accommodate. 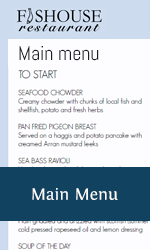 Menu is in pdf format. If you need Adobe Reader click here. Menu opens in a new window/tab. 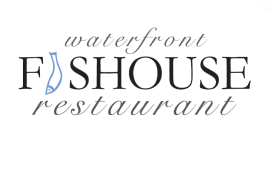 For parties larger than 6, please email info@waterfrontfishouse.co.uk.